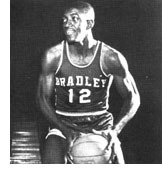 Levern Tart, the Most Valuable Player in the 1964 NIT Tournament won by his Bradley Braves, once led the American Basketball Association in scoring. A versatile three sport standout in Florida high school athletics, he went on to score 1,0753 points in a brilliant career at Bradley. 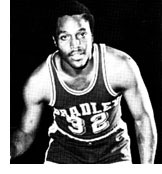 His precision passing, aggressive rebounding and accurate shooting made him one of the most popular athletics in Bradley history. He led the Braves to 24 wins and a Top Ten national ranking in his senior year. He played in two NIT's with Bradley winning the 27th NIT in his senior season. Tart was named all-tournament and then went on to a professional career, playing with both Oakland and New Jersey in the American Basketball Association. He had tryouts in both professional baseball and football also, even though he did not play the sports at Bradley. A fine all-around player, he scored 331 points in his sophomore season of 1961-62, had 219 the next year when he missed part of the season and saw duty in only 17 games, and then finished with 503 points in his senior year.